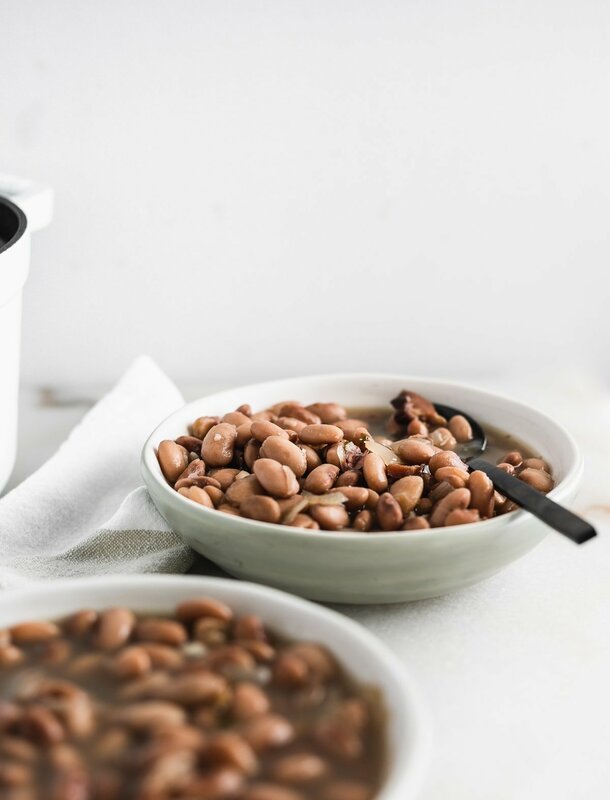 For as long as I can remember, almost every one of my family gathering on my dad’s side (except for Thanksgiving) was sure to have one thing – a big pot of homemade pinto beans. 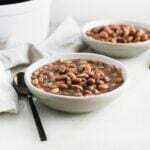 My aunt always made the best easy pinto beans, and she taught my mom, my cousins and me to make them at our family lake house, where we would spend the weekends cooking, fishing, and eating lots of delicious food. My dad usually smoked a brisket or ribs, while the girls made potato salad, beans, and pie inside. It’s where I learned how to make many of our traditional family recipes. These pinto beans are amazing for many reasons. First, they go with almost anything. From Tex-Mex meals like enchiladas and taco salads, to BBQ brisket and ribs, to just a steaming bowl with cornbread, pinto beans are great with so many meals! 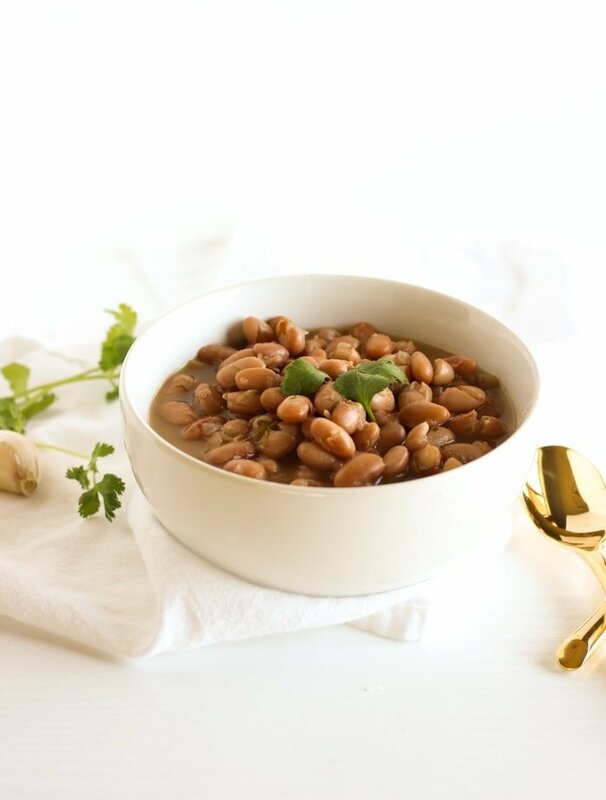 These pinto beans are also so easy to make and super affordable. 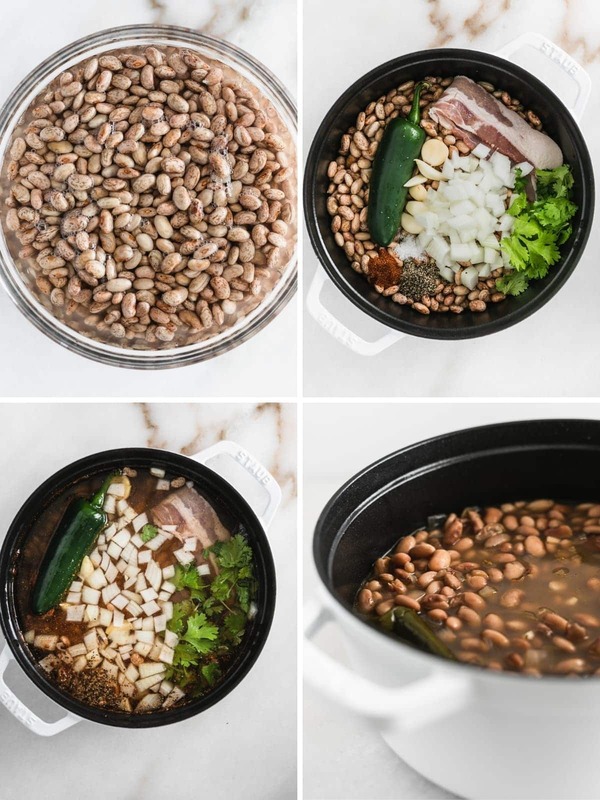 You start with a pound of dried beans and add a few simple flavoring ingredients, and you end up with a big ol’ batch of delicious, steamy beans with so much flavor. And they take so little effort! 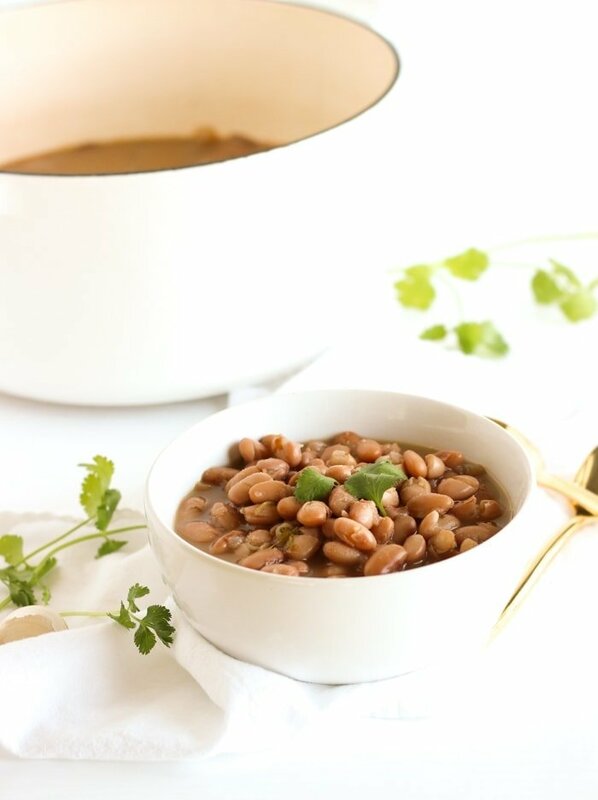 Beans are also a great vegetarian source of protein, and they also provide fiber, iron, B vitamins, and potassium. 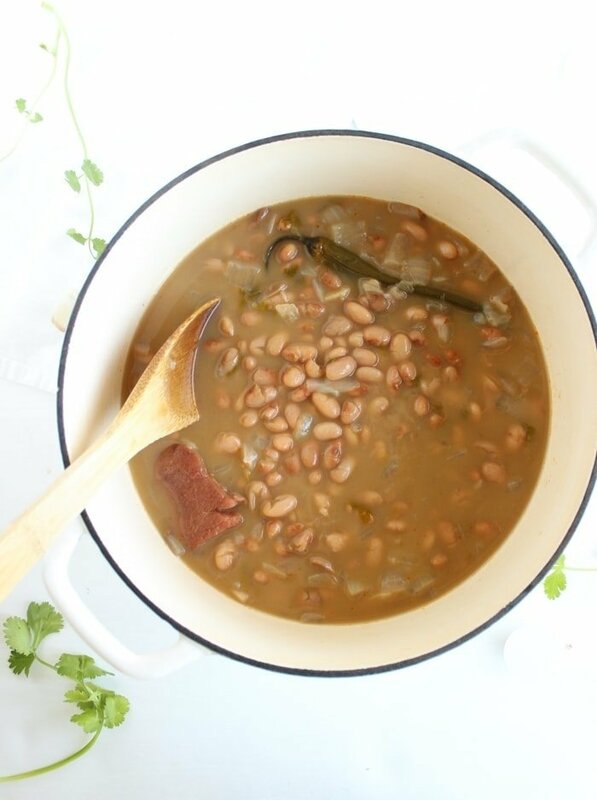 I love having a big pot of these beans to eat throughout the week with dinners and lunches. Sometimes I freeze half of them for later, or make some baked beans with them. They’re so versatile! These beans are so flavorful and delicious, and take so little effort. Just remember to soak them the night before, or you ‘ll have to do a quick soak the day you want to cook them. It’s not the end of the world, but it’s easier if you soak them beforehand. 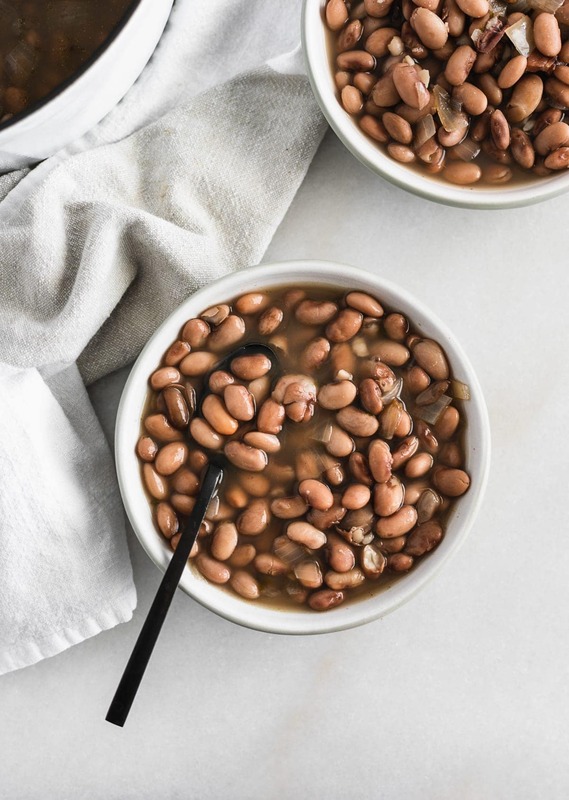 If you need a super easy weeknight dinner or side dish, make a pot of the best easy pinto beans from scratch, and you have an easy, healthy solution to help you out all week long! Soak beans overnight: Pour beans into a large bowl or pot. Sift through and pick out any small rocks that may be present. Cover beans with water (at least 3 inches over beans) and let sit on the counter overnight. If you forgot to soak the beans (it happens! ), use the quick soak method** (see notes). Drain and rinse beans. Place in a large heavy-bottomed pot with a lid. Add onion, garlic, jalapeno, cilantro, and ham hock, if using. Add spices (this is also the time to add tomatoes and Mexican spices if you are making that version). Add chicken broth if using and fill with enough water to cover beans at least 2 inches with water. Place lid on the pot and heat over medium-high heat. Boil beans for 1 minute, then turn heat to low. Simmer 2-4 hours or until beans are tender. **For quick soak method, rinse and drain beans. Add to a pot and cover with at least 3 inches of water. Cover, turn heat to high, and bring to a rapid boil for 1 minute. Remove from heat and let soak, covered, for 1 hour. Then drain and proceed with the recipe. **For slow cooker, follow directions as written, but add beans to your slow cooker instead of a pot on the stove. Cook on high about 3-4 hours or until tender. **For Instant Pot, add all ingredients to the pot of the Instant Pot. Close and lock lid and seal vent. Cook on high pressure for 25-20 minutes for unsoaked beans or 8-10 minutes for soaked beans. Let pressure release naturally before removing the lid. Thank you for sharing such an easy and delicious recipe. I just made it and ate some without anything they were so good just like that. But I’m excited to have them to take to work for lunch all week, will save time and help me eat healthy. I’m so glad you enjoyed the recipe. I love having the leftovers too! It could vary based on the heat of your stove, how long the beans were soaked, etc. You can cook them longer without affecting the texture, but the longer you cook them the more flavor they will have. Thanks for stopping by! I am making them for my Thanksgiving meal. Thanks so much for the recipe. Do you put the jalapeño in whole.